(Player's Choice) 2004-10-22 €? ? ? (PC/Mac) 2006-05-31 €? ? ? 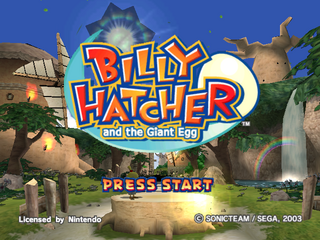 Billy Hatcher and the Giant Egg , known as Giant Egg: Billy Hatcher no Daibouken (ジャイアント エッグ ～ビリー・ハッチャーの大冒険～) in Japan, is a video game for the Nintendo GameCube that was developed by Sonic Team and published by SEGA on September 23, 2003 in North America. Morning Land is a peaceful realm inhabited by chickens. One day, a terrible fate befell the land. Black Crows empowered by a mysterious magic appeared as ferocious monsters bent on keeping the world in eternal night. The Chicken Elders whose voices bring dawn each day were captured and sealed within golden eggs. Without their morning cries, the world will remain engulfed in darkness and human hearts will be consumed by evil. Now, only young Billy Hatcher and his friends can defeat the Crows, release the elders and return morning to the world. The 4 characters playable in the multi player games are based off 4 of the main Sonic the Hedgehog characters - Billy is Sonic, Chick Poacher is Tails, Bantam Scrambled is Knuckles and Rolly Roll is Amy. The Hatcher characters use similar colors and copy poses - Billy on the boxart is in the same pose Sonic has in some of the Sonic Adventure 2 artwork (see below vs the boxart). Circus Park and Pirates Island are both names for levels seen in later Sonic the Hedgehog titles. Coincidentally, the composer of both level themes is this game's sound director. Music and Sound Designed by: Wave Master Inc.
Main article: Billy Hatcher and the Giant Egg/Magazine articles.